For those of you who may not know, my husband Micah and I are huge into the outdoors. And what's the best way to experience the vast and varying regions of this beautiful country that's the U.S. of A? Going to National Parks, of course! Our goal is to visit each national park (at least right now)in the continental United States. Here you'll find our experiences, all good and bad, about each park we've been to thus far. Crater Lake National Park holds a special place in my heart. It's the most local national park to me and it's also where I got engaged. The park is a natural world wonder, with a vastly deep lake, a small island in the middle of it, and gorgeous wildlife and foliage surrounding it. I actually didn't go to Crater Lake for the first time until I was in college, but I've been several times since then. The rim around the crater is picturesque provides several scenic views and trails to hike. The best time to go, however, may be in the winter. 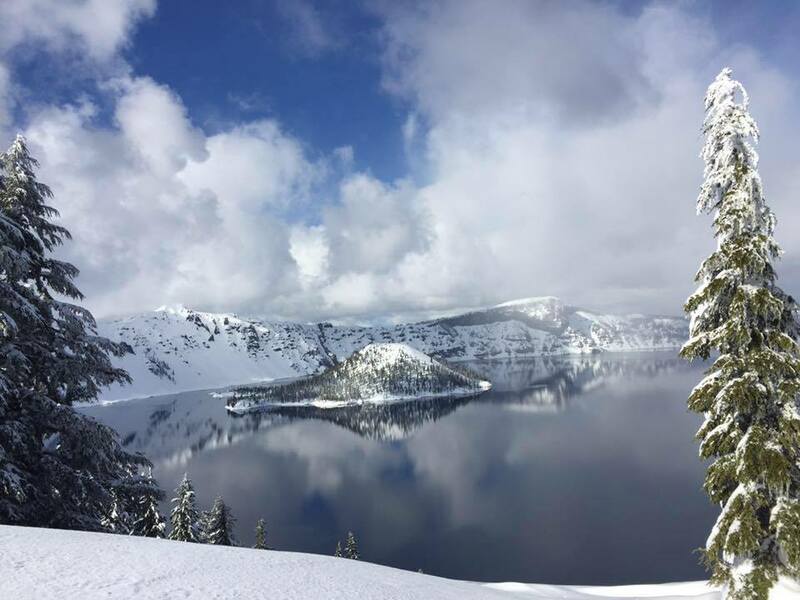 While there is less to do because of the huge amount of snow the park gets each winter, there are a fraction of the people there than in the summer, and free snowshoe tours lead by a ranger takes you to some of the best views of Crater Lake. Of course, the drive there was slushy and sometimes icy and it was freezing, but the trek is worth it. This was my first snowshoeing experience. Our group had maybe twenty or more people in it. The ranger knew everything about the park, from wildlife to the terrain, but also made sure to stop so people could slide down a snowbank for kicks and giggles. As the snow crunched under our snowshoes, the ranger informed us that we were walking on top of trees buried in snow. He even pointed out several track marks in the snow, asking us to guess what kind of animal it was. Some people guessed deer, rabbits, even birds. With a delighted smile, the ranger said it was a squirrel. The hike last a little over an hour. Just enough time for everyone to get a good workout in with the awkward walking snowshoes require as well as providing just enough education to keep the hike light and interesting. We ended back where we started by the lodge. Micah asked the ranger if we could hike a little bit longer, just over a hill and back, and he allowed it if we didn't take too long, since the snowshoes weren't ours. We traversed back around a steep snowbank, past another tour, and stopped at a breathtaking view of the glass-like lake several hundred feet below us (pictured to the right). "Well, Jordan," Micah said behind me, out of breath, nervous. "Will you marry me?" 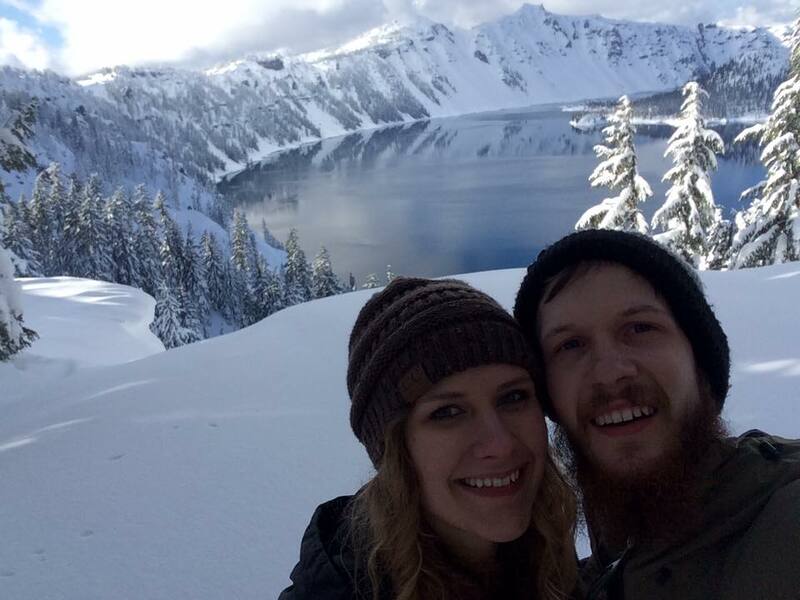 Needless to say, Crater Lake National Park is one of our favorite parks. I didn't know Lassen Volcanic National Park exhibited until Micah suggested going to it with our friends Grayson and Chloe. Hidden in Northern California, the park is rich with meadows, trees, unique rock formations, and fumaroles. Founded August 9, 1916, the park is made up of 106,000 breathtaking acres scientists love to research. When the park's area was first discovered by pioneers, they believed any volcanic activity was long in the past and not likely to happen again. 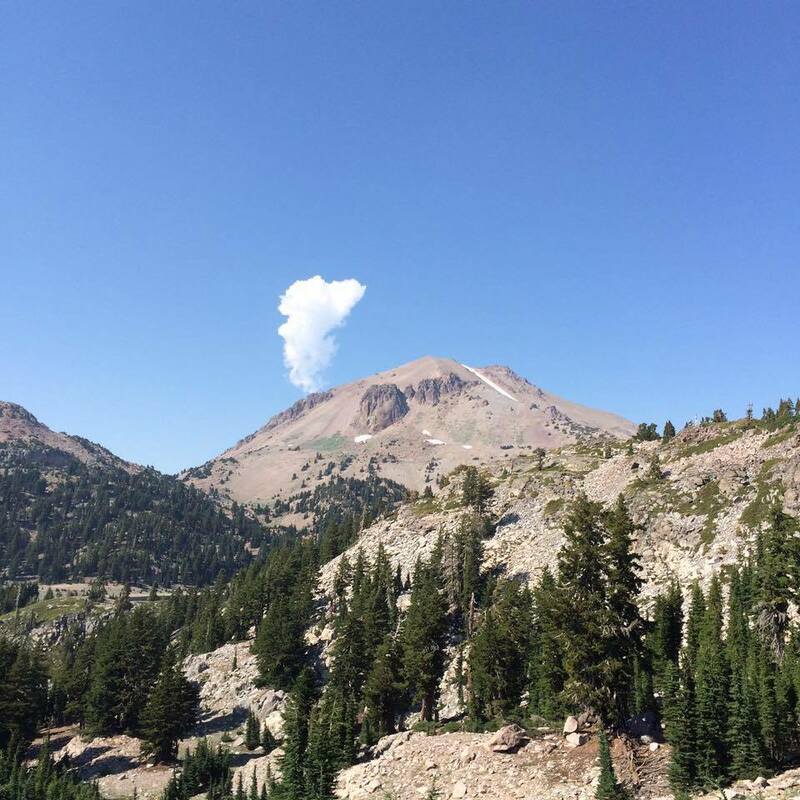 However, in 1914 Lassen Peak proved explorers and pioneers wrong by erupting. More eruptions took place throughout 1915, changing the landscape considerably thanks to ash, lava, and rocks. All four types of volcanoes are found here, from plug dome, shield, composite, and cinder cone. National Geographic's Guide to National Parks calls Lassen "one of the least discovered parks in the western United States." That doesn't seem far from the truth since we were there for the day and I think we saw only one third of it. The drive inside the park showed us a taste of what we were going to get: a copious amount of trees and gorgeous landscapes. We started at Sulphur Works, a 0.8 mile hike taking hikers right to the heart of colorful fumaroles. The most memorable part about it might be the overbearing smell of sulfur, but it didn't subtract from the area's awe and wonder. The hike after this took us to rockier areas littered with small critters, birds, and plants. We ended the day at Emerald Lake, which is more like a crystal blue pond with a perfect view of Lassen Peak. The water was cold but refreshing. We swam while often gazing up at the rocky peak, still wearing a few patches of snow from last winter. I wish we had more than a single day at this park. Next time we go we've already decided we need to spend at least three days to experience much more of the park. Several campgrounds and lodges are available inside the park, as well as two visitor centers and multiple ranger stations. While the park is open year-round, parts of it tend to close at certain points throughout the year due to weather. All in all, this hidden gem of a national park is vast and deserving of a few days well spent on its well-maintained trails and pristine meadows.